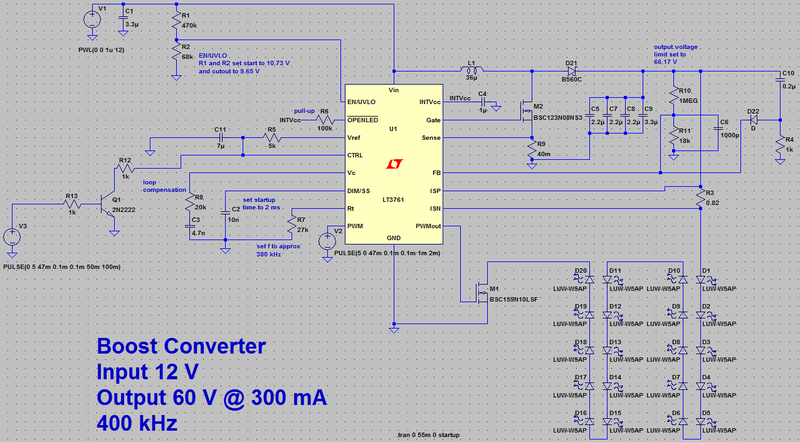 My ongoing series on designing a boost converter continues. Today's post will be short one. What happens in the converter during startup? The period between when you first apply power and when the controller starts to do it's thing. Using the schematic further down the page as a reference, the startup waveforms below can be described. 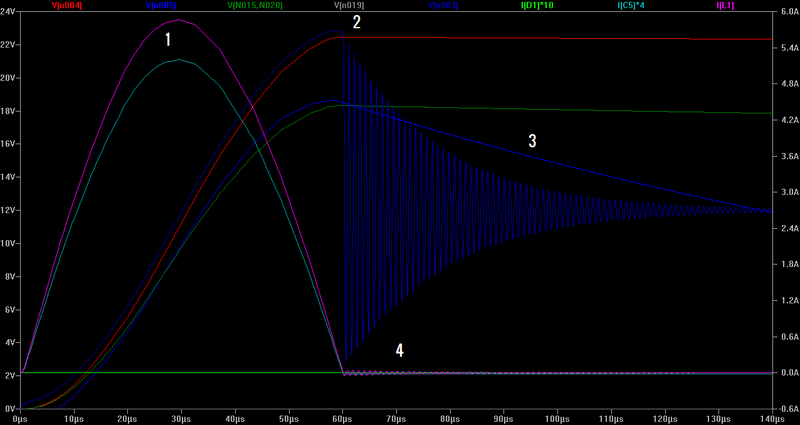 It's also helpful to know the period of an LC oscillator as well. During startup the power mosfet (M2) is off, and can be ignored in this analysis. The current in inductor L1 (36 uH) is zero and the voltage across the output capacitor bank C5, C7, C8, C9 (9.9 uF) is equal to zero. When the 12 volt supply is first applied, the inductor L1 and the capacitor bank start to resonate. This causes the initial peak. The initial inductor current (purple) should resonate around zero amps. Knowing that the peak voltage deviation will be 12 volts (i.e. the voltage across the capacitor will have a range of 12 ± 12 volts) it can be shown that the current through the inductor L1 will be equal to 12*sqrt(C/L). In this case that equals 6.29 Amps. We get close with around 5.8 Amps. The forward voltage of the diode means that the supply is more like 11.4 Volts and there are also some series resistances that will cause the current to be lower. That equation is only valid for steady state analysis as well. In theory the voltage across the capacitor bank (red) should peak at double the input voltage, as an undamped LC circuit will swing to double the magnitude of a step input to give 24 Volts. In this case however, the forward voltage of the diode and small resistance of the inductor has reduced this to the 22.4 ish volts observed in the simulation. At this point we have approximately one half period of oscillation. Although meant for a steady state conditions, this can be checked against the formula above. t = 2*pi*sqrt(LC) = 118us. Half a period is approximately 60 us, pretty close. Another effect starts to happen at this point as well, for the first time the inductor current goes to zero and tries to reverse. The diode doesn't allow this to happen, leaving the output capacitors charged at around 22.4 volts. The inductor starts to immediately resonate with the parasitic capacitance of the mosfet. The damped oscillations have a period of approximately 1.05 us. Using the equation above it can be shown that the parasitic capacitance is 775 pF. The current ripple can also be seen in the inductor. Get the associated files here.